We work hard to make your vision come to life. This is our work. 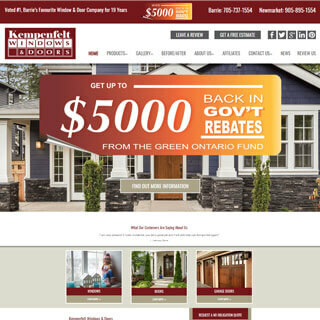 About Our Client: Voted Barrie’s favourite window and door company for 19 years in a row, Kempenfelt Windows & Doors provides customers with leading products and exceptional service at a competitive price. 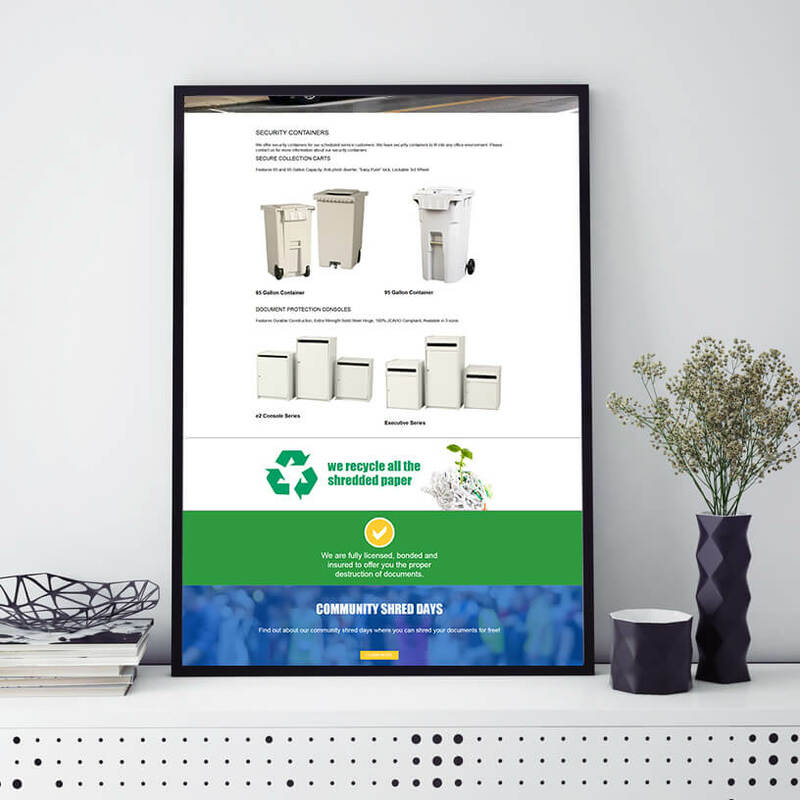 The Project: This website redesign was an exciting project for us. We were already providing SEO services and they were ranking exceedingly well. 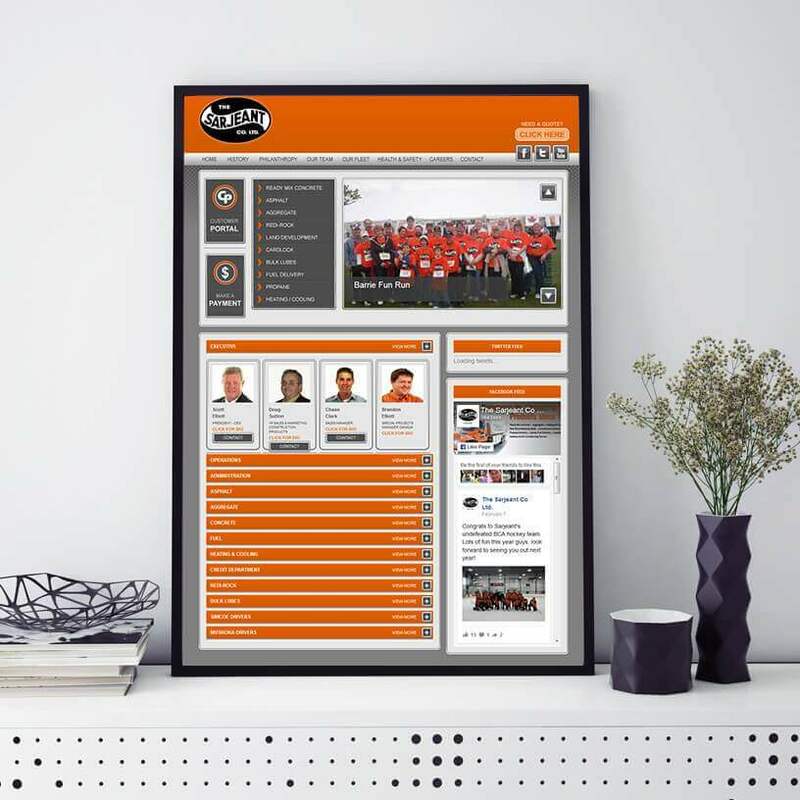 However, it was time for a complete website makeover! 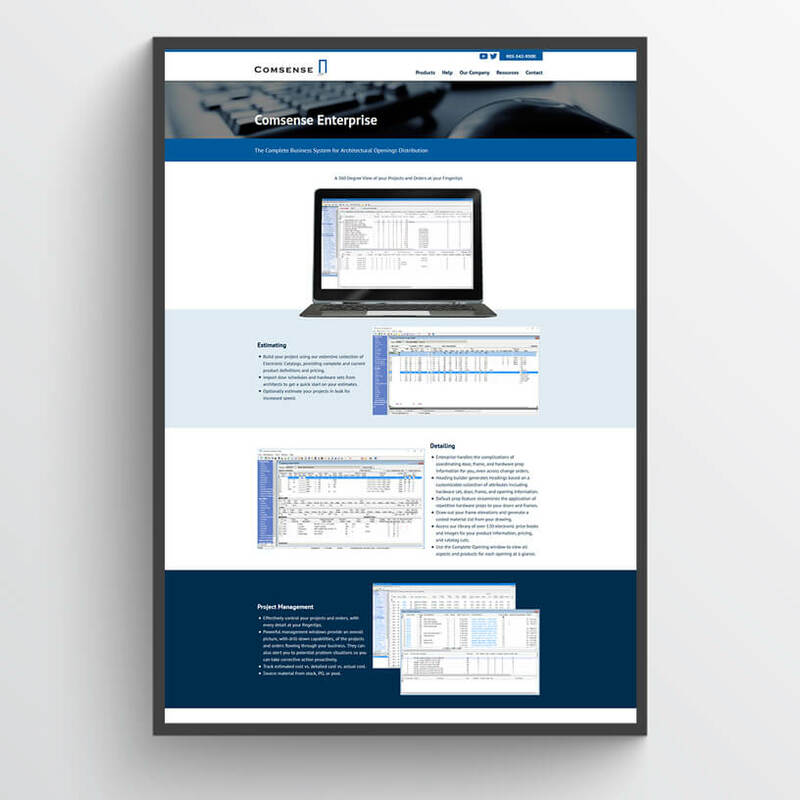 Our imperative was clear: enhance user experience and improve conversion rates. 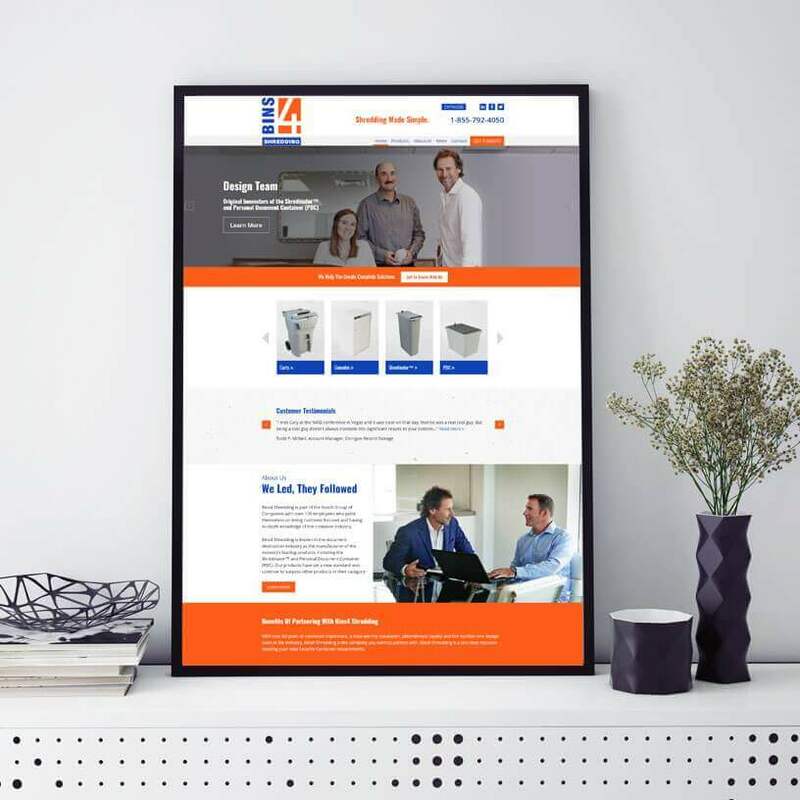 We accomplished this with a clean, modern design, attractive imagery and implementation of conversion psychology. 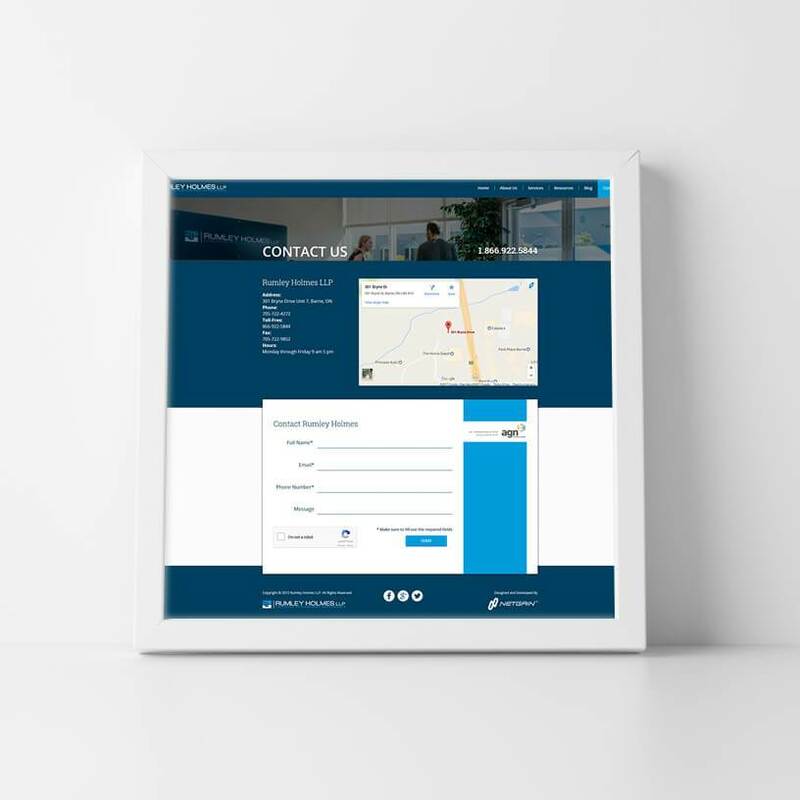 Fast, mobile-friendly, web development. Extensive photo gallery. 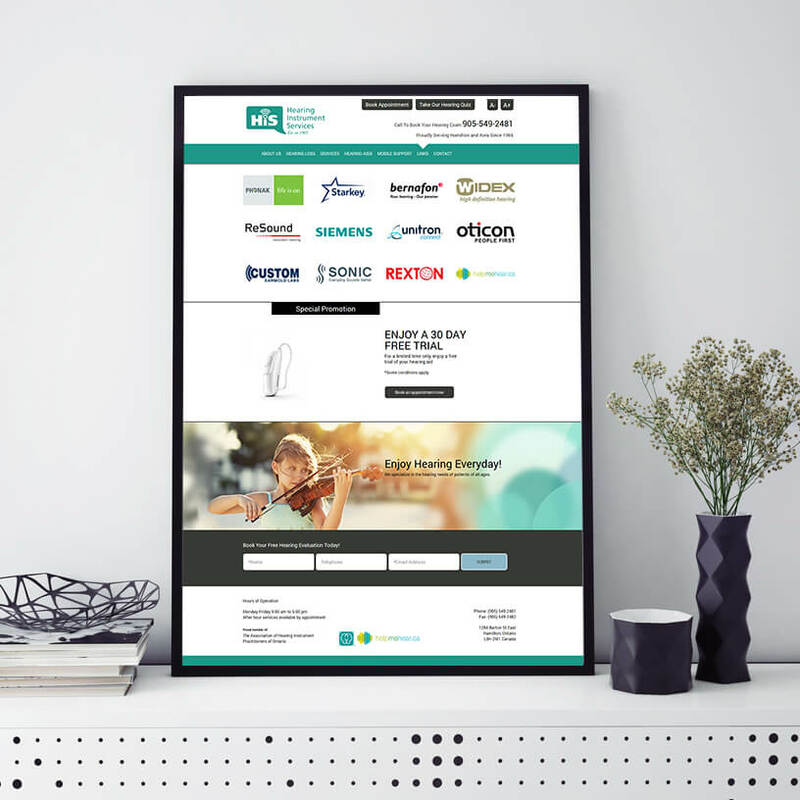 Online advertising including Google AdWords and display ads. 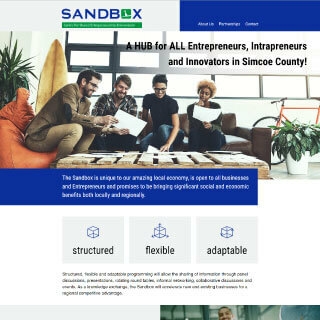 About Our Client: Located in the heart of Downtown Barrie and overlooking beautiful Kempenfelt Bay, The Sandbox will provide a wide variety of services to innovators, entrepreneurs, and intrapreneurs. The space will act as a hub to foster collaboration and accelerate growth for innovative startups. 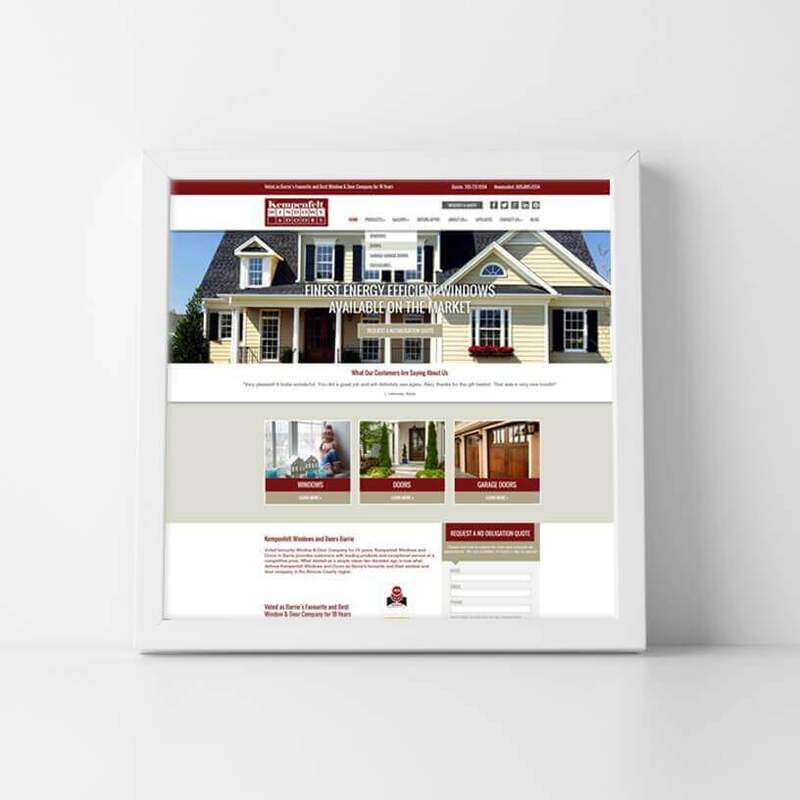 The Project – Website Design: Prior to opening its doors, The Sandbox needed to make a splash with their web presence. 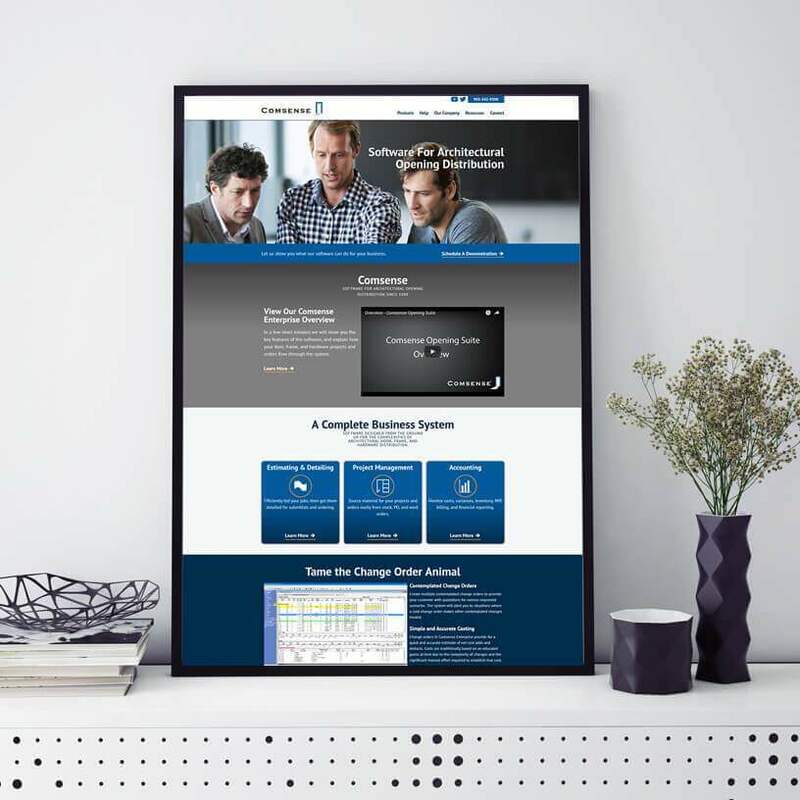 NetGain was delighted to create a flashy new website to generate excitement in the business community. New startups can sign-up for progress reports and corporate sponsors can learn how to become involved in the project. 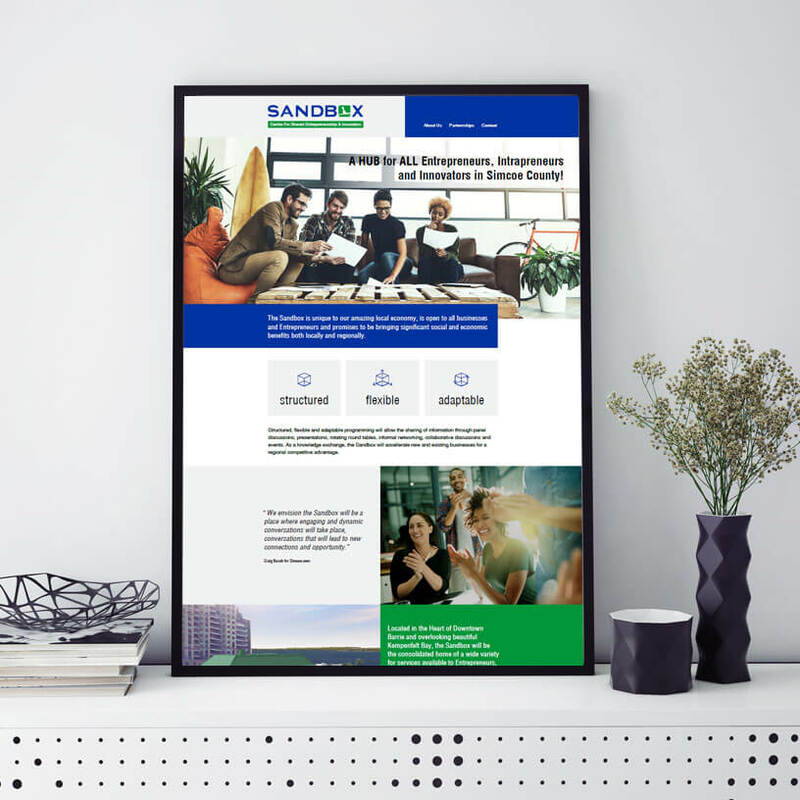 Special Features: NetGain was proud to develop branding for the Sandbox including: logo design, marketing collateral, and brand guidelines. 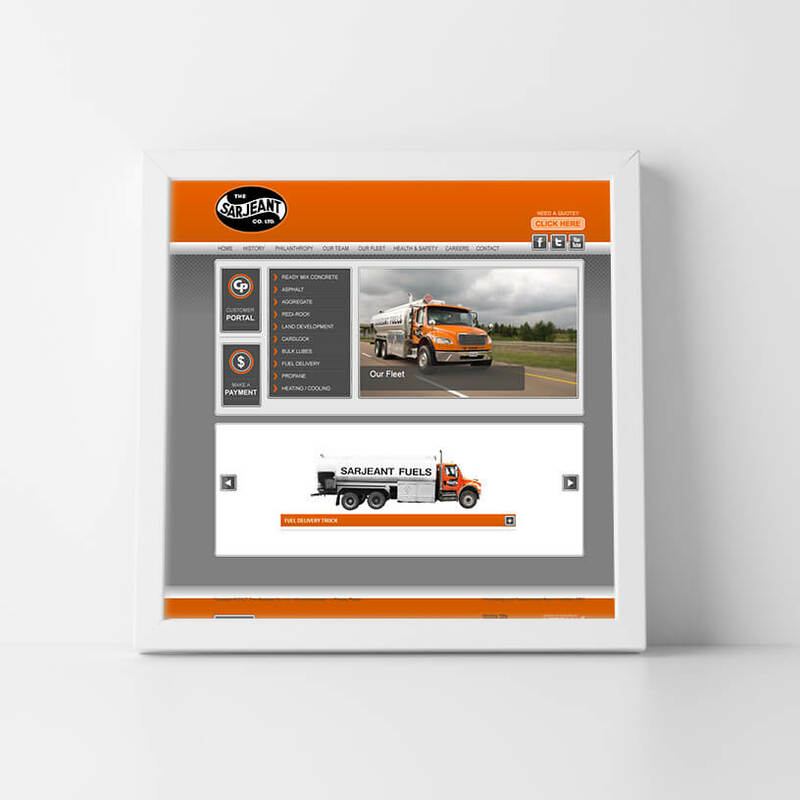 Our mobile responsive website design ensures that this site looks terrific on a desktop, tablet, or smartphone. 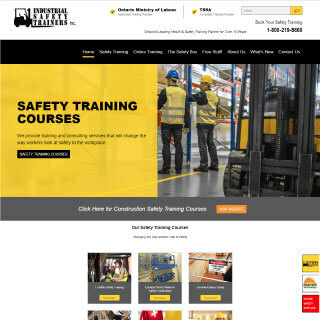 About Our Client: Industrial Safety Trainers is fast becoming one of the largest training providers in Canada. They offer training and consulting services that change the way workers look at safety in the workplace. Training can occur at a variety of different venues including their state-of-the-art mobile training center called the Safety Bus. 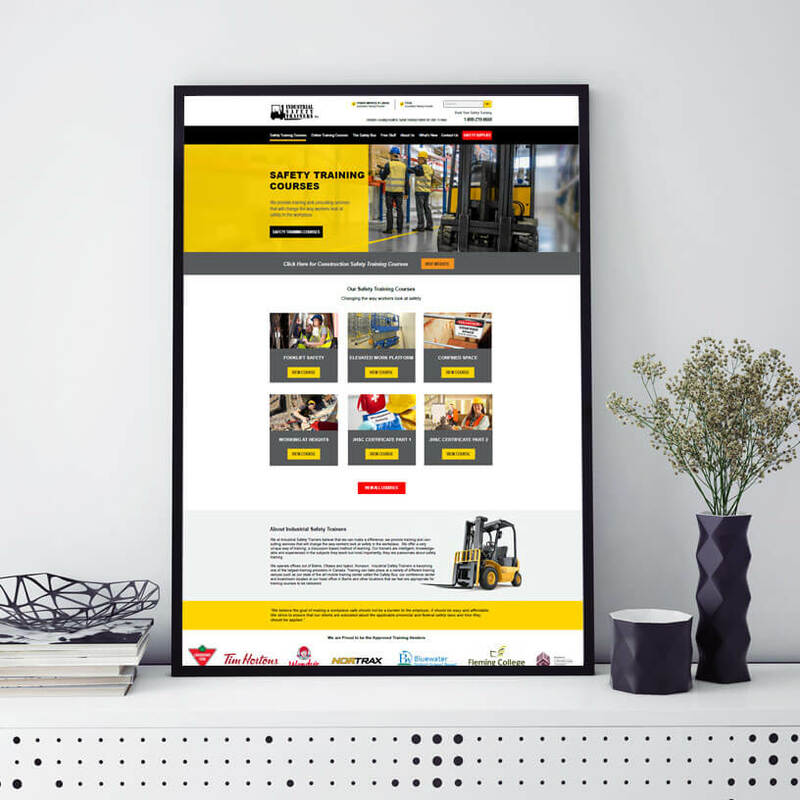 The Project – Website Design: Thanks to our existing SEO plan, Industrial Safety Trainers was already performing extremely well in Google organic rankings. 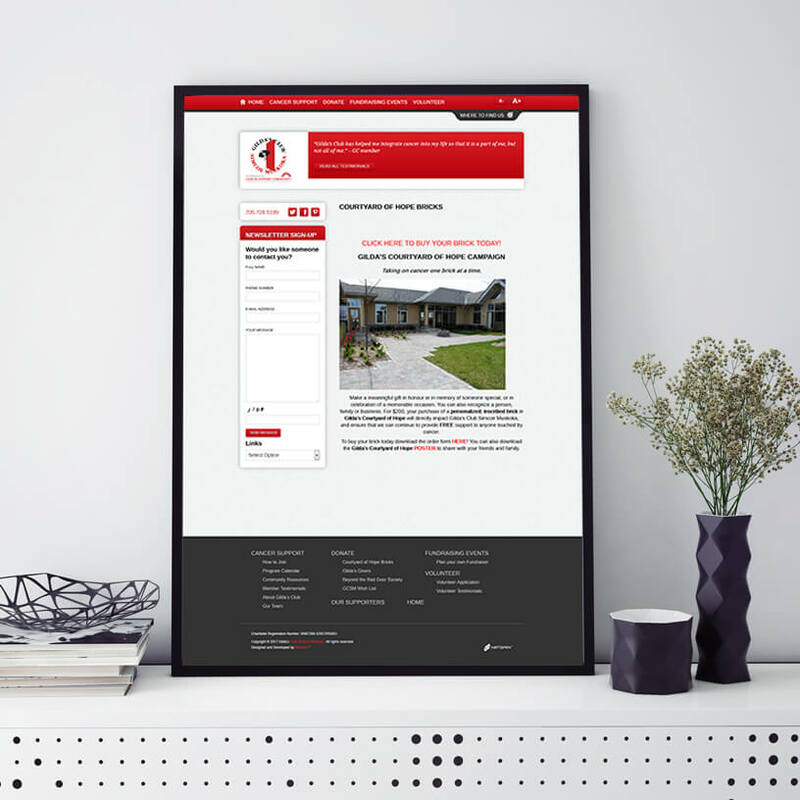 When it came time to refresh their website, we jumped (with our safety harness securely fastened) at the opportunity. 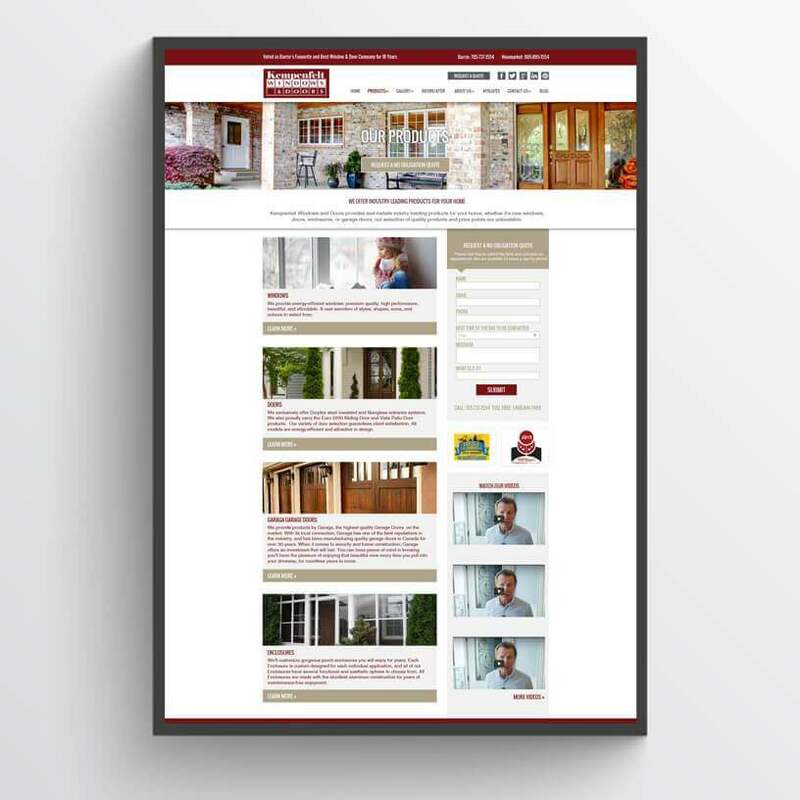 In fact, this website redesign project morphed into a triple website. 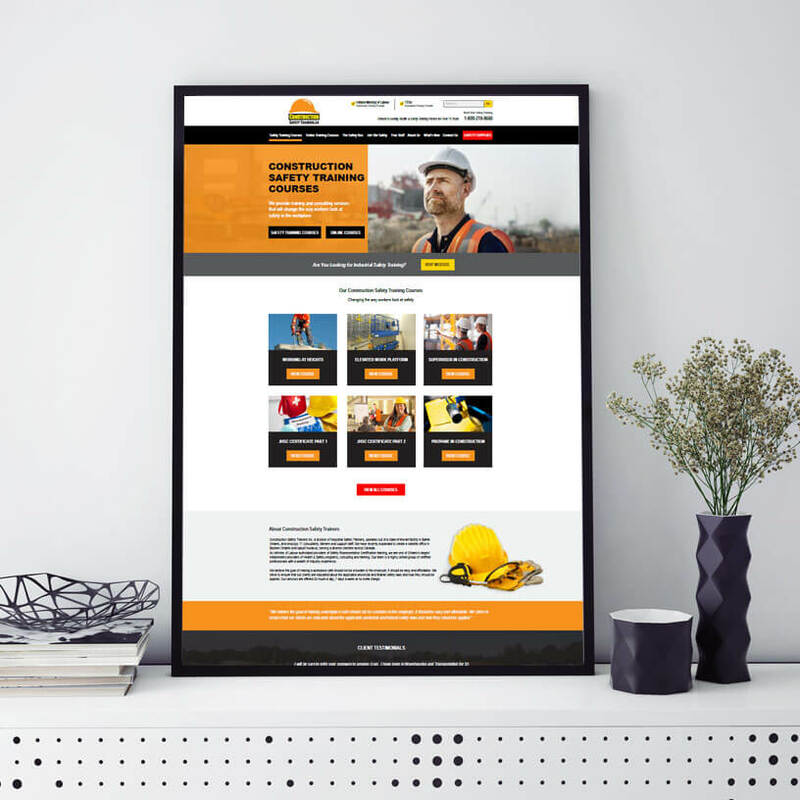 We took the opportunity to build websites for their sister companies: Construction Safety Trainers as well as Online Safety Supplies. 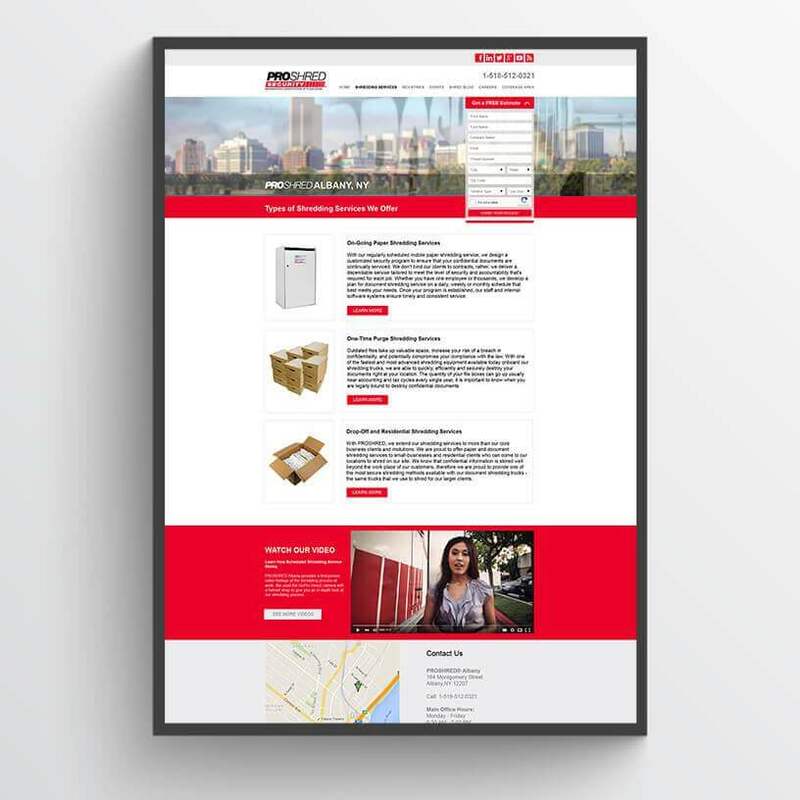 Special Features: NetGain incorporated an E-Commerce platform so customers can purchase safety supplies online. 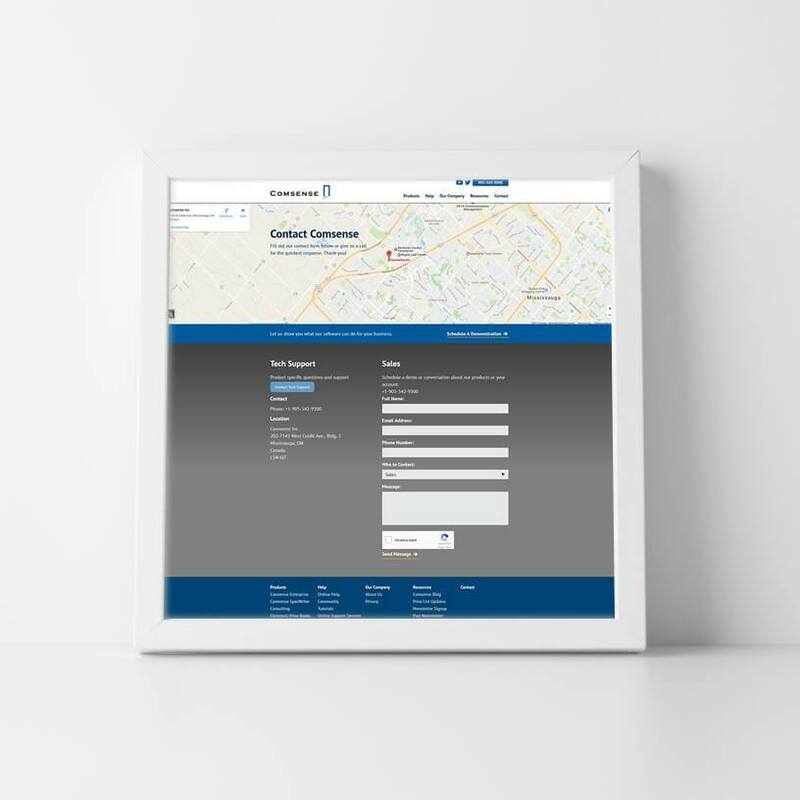 We also integrated a registration process, so attendees can search and sign-up for local safety courses offered across the province. 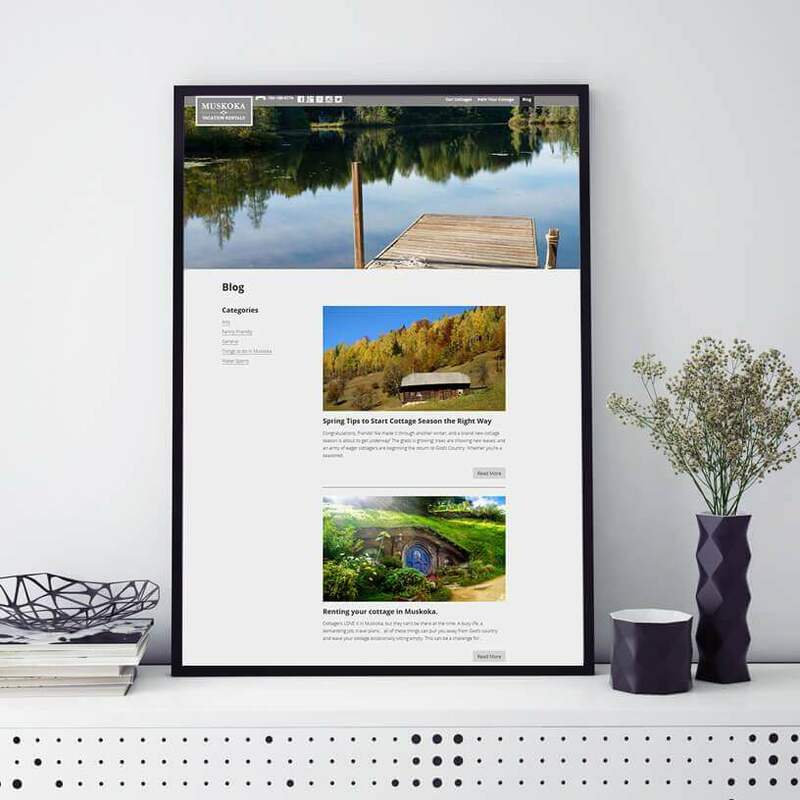 We built all 3 websites on the WordPress multisite platform, so our client can make updates to curriculum and courses from one simple login. 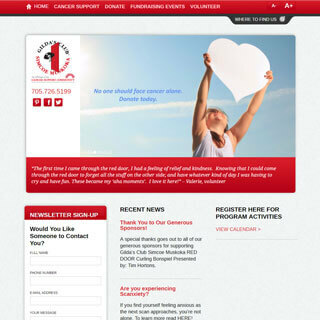 About Our Client: A free program of social and emotional support for anyone who is feeling the impact of cancer. Gilda´s Club is a place to find inspiration in a community atmosphere with others who are facing cancer. 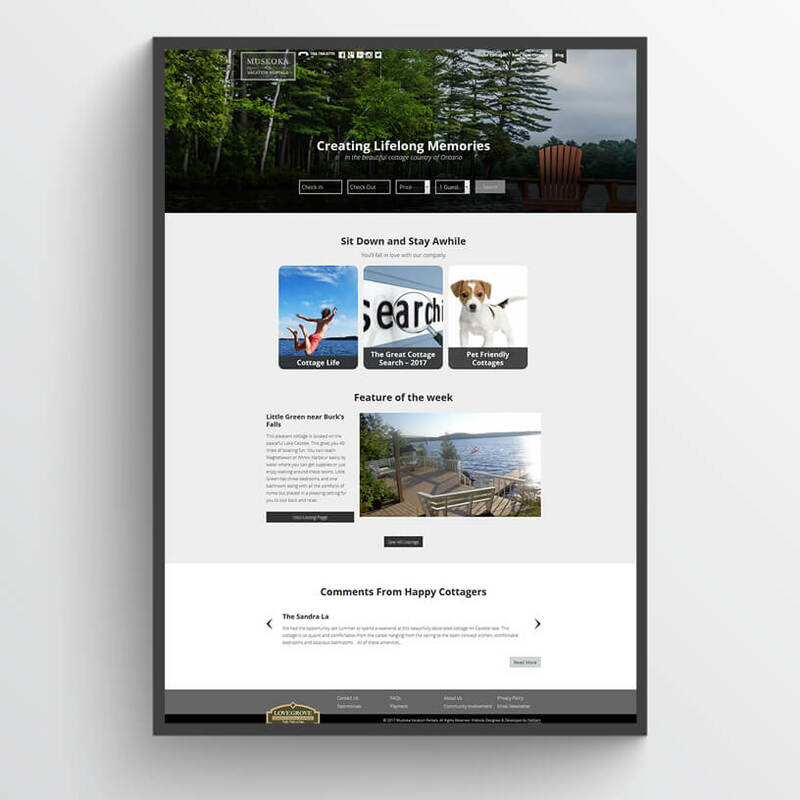 The Project: Gilda’s Club Simcoe Muskoka is a not for profit organization that needed a custom designed website. 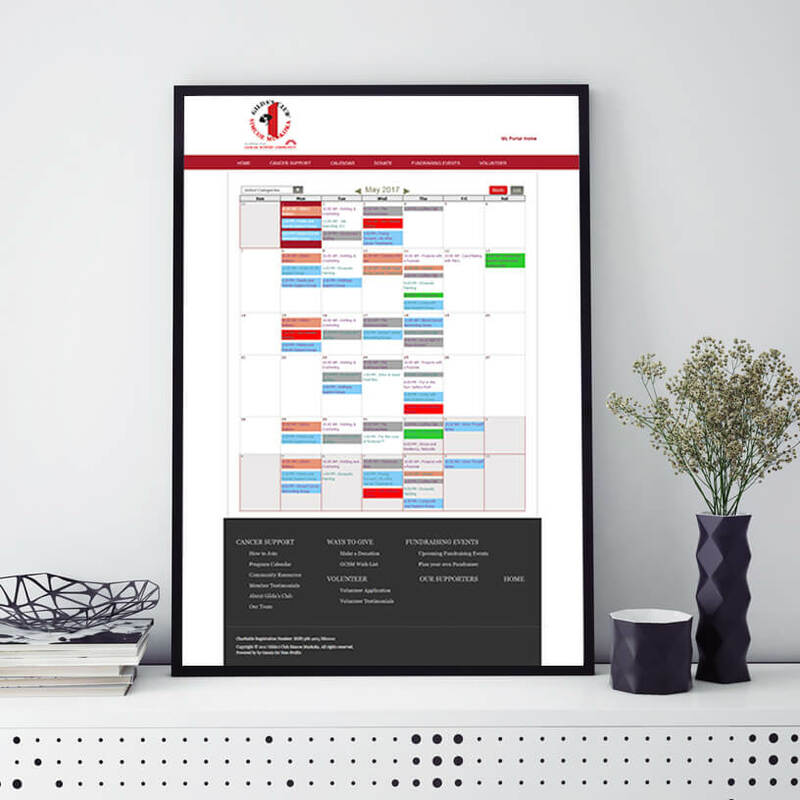 The largest feature for this project was the dynamic event calendar. The calendar required advanced filtering for various events as well as a shopping cart system for purchasing events. 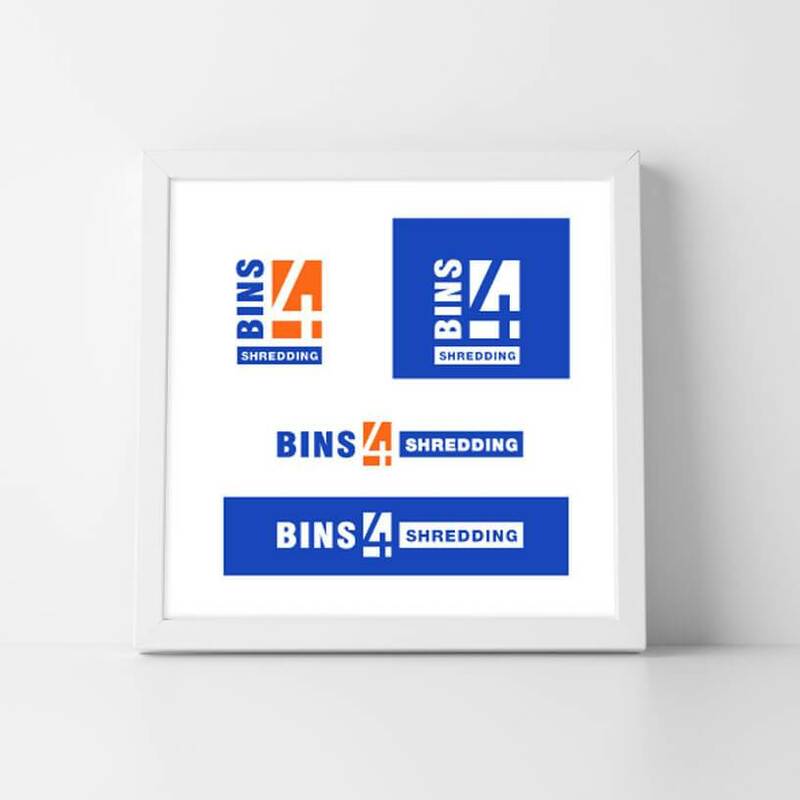 The development of the site required dynamic graphics for easy use, community feedback and to relay a feeling of strength..
About Our Client: Bins4 Shredding is well-known in the document destruction industry as the manufacturer of industry-leading containers. 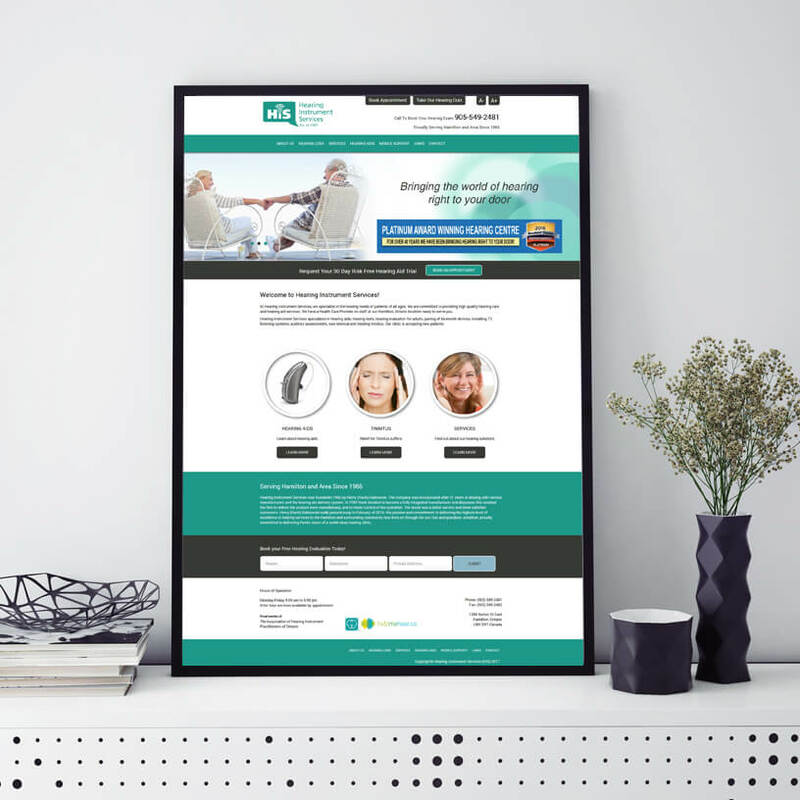 The Project: NetGain is proud to have helped launch this brand from inception with logo design and full branding. 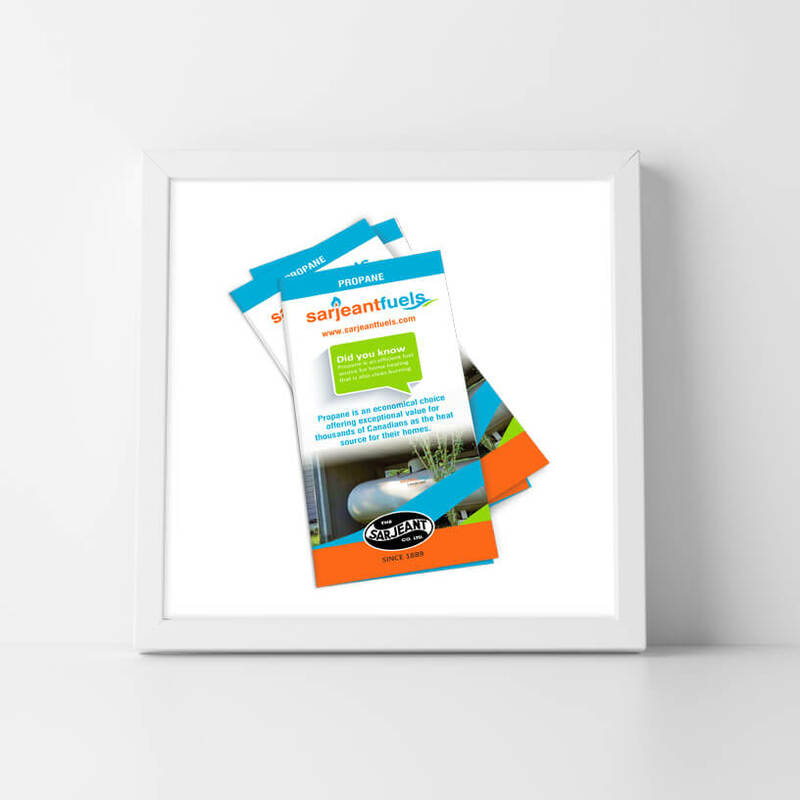 Our graphic artists created marketing materials including brochures, catalogues, business cards, trade show booth design. 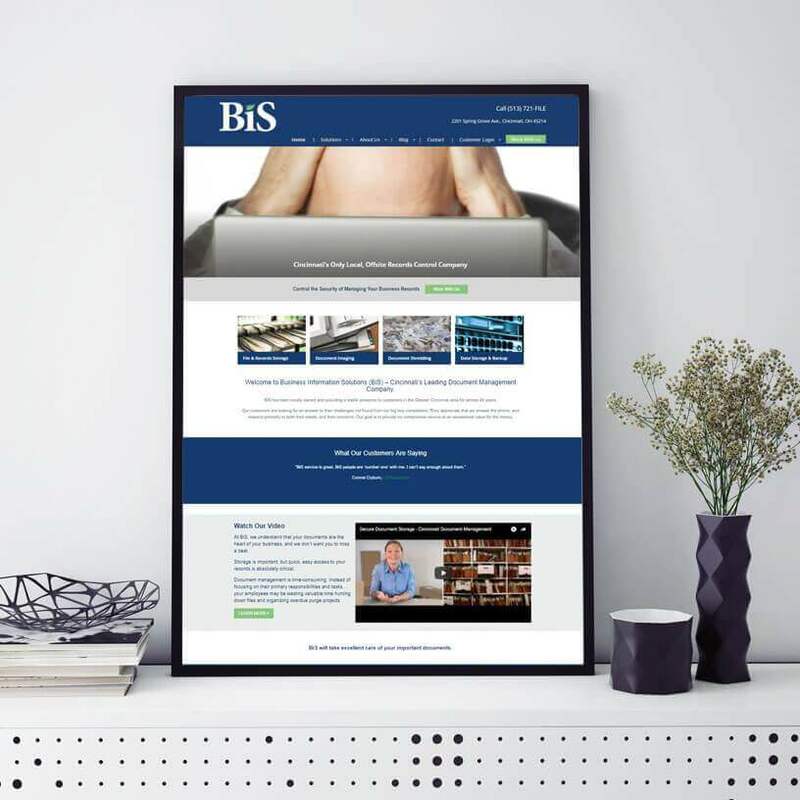 We launched a beautiful website and continue to support it with technical SEO, an e-blast newsletter service, and social media outreach. 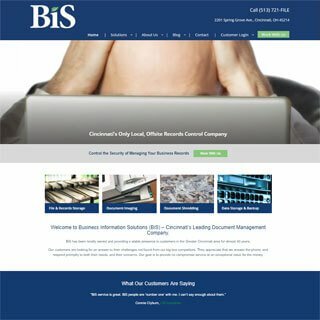 About Our Client: BiS is a commercial records center that has been serving the Cincinnati area for over three decades. 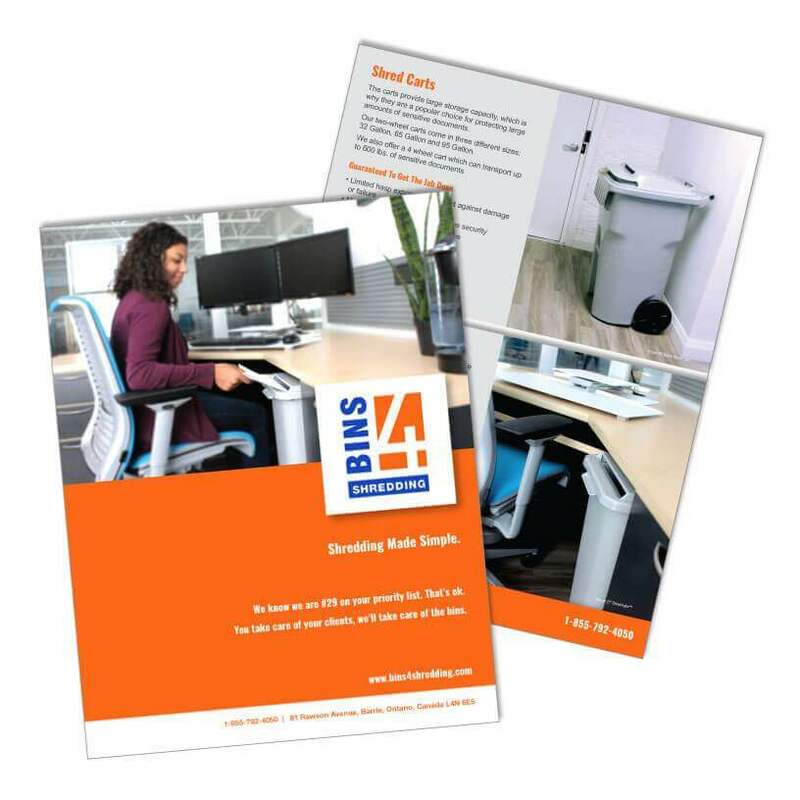 Their offerings include: document storage, scanning, and shredding. 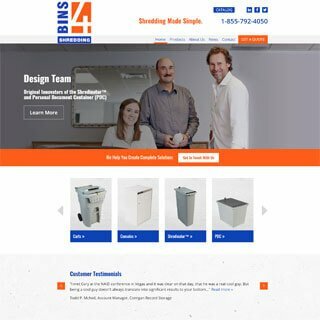 The Project: Our client wanted to modernize their web presence with a fresh look and a mobile-friendly website. 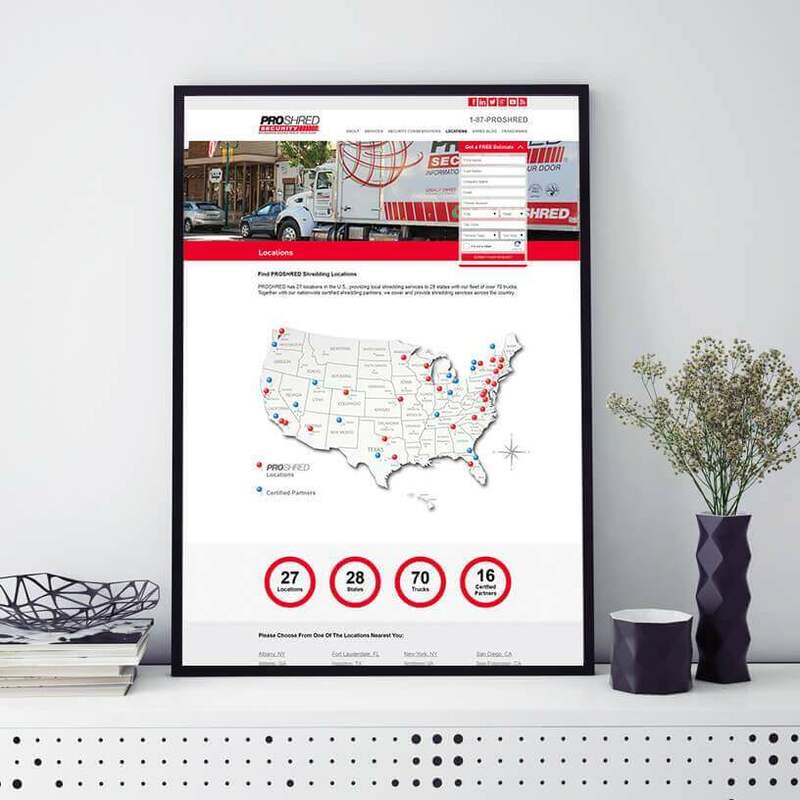 Realizing that it is not sufficient to simply have a pretty website, they have engaged NetGain to provide optimization services in an effort to outrank their local competitors. 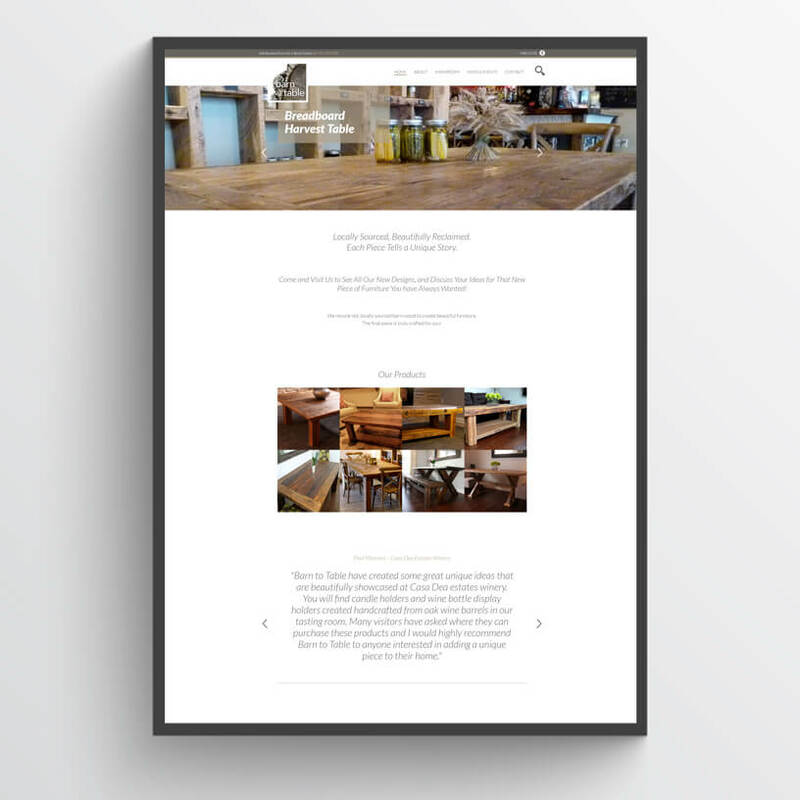 Special Features: Web Design. SEO Services. Collaborative industry news feed. 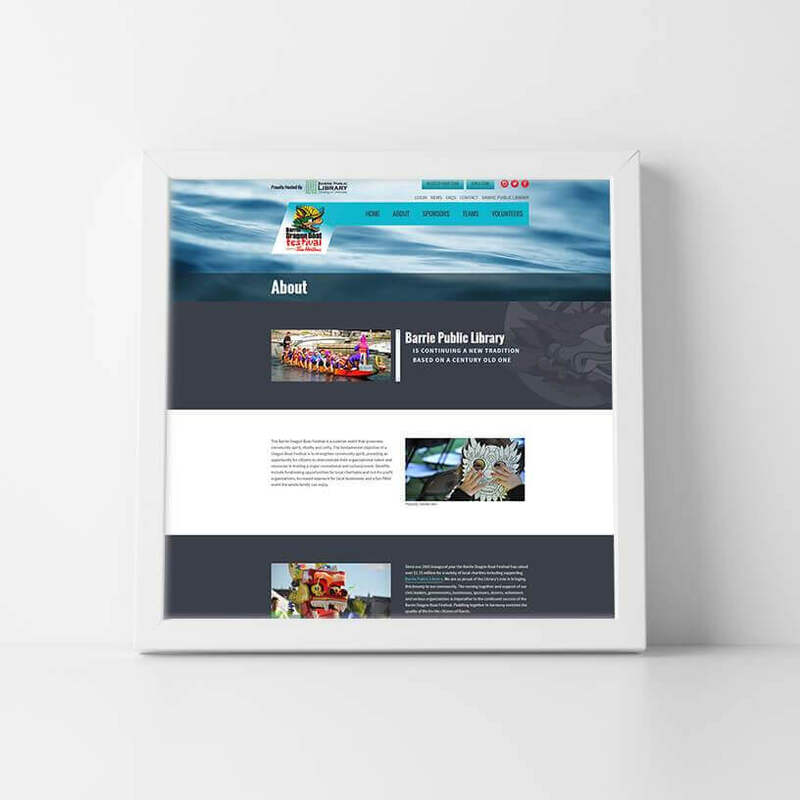 About Our Client: The Barrie Dragon Boat Festival is a summer event that promotes community spirit, vitality and unity. 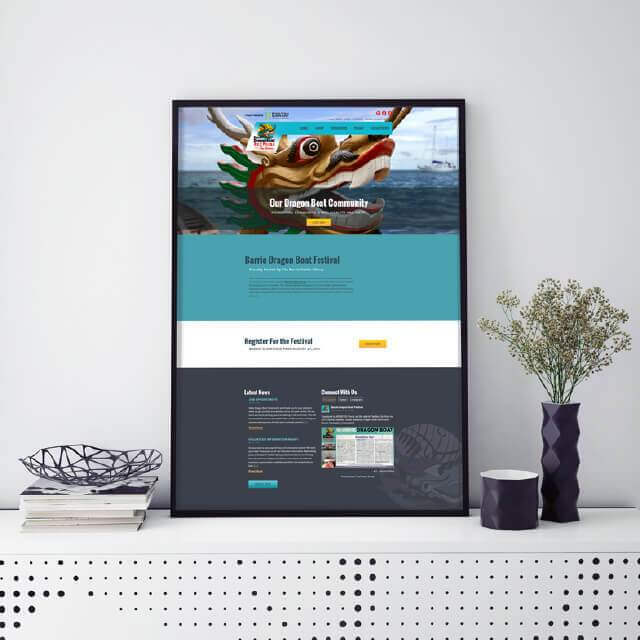 The fundamental objective of a Dragon Boat Festival is to strengthen community spirit, providing an opportunity for citizens to demonstrate their organizational talent and resources in hosting a major recreational and cultural event. 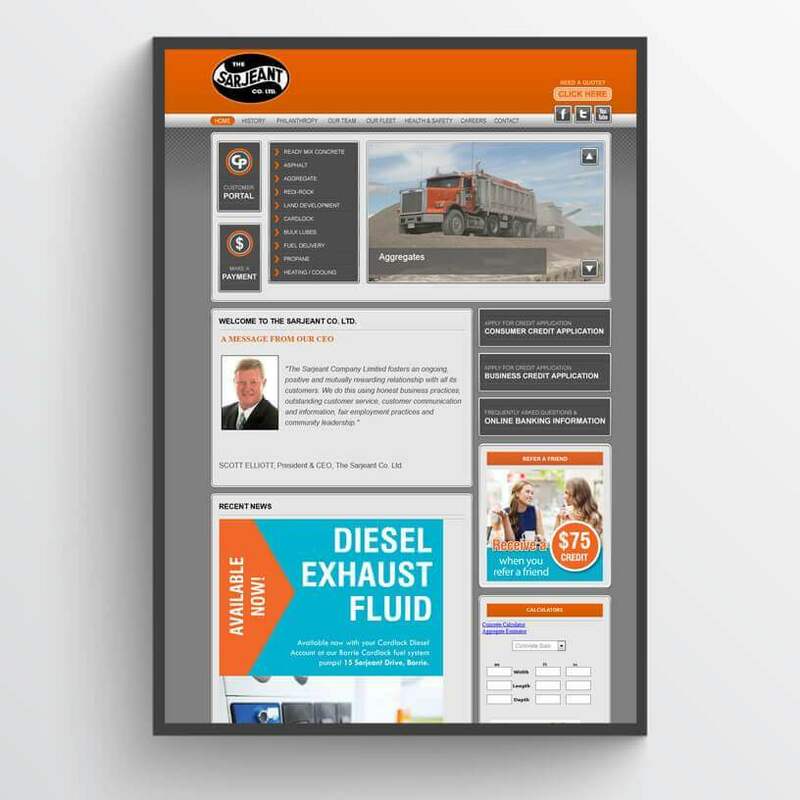 Full Web Design and Development. 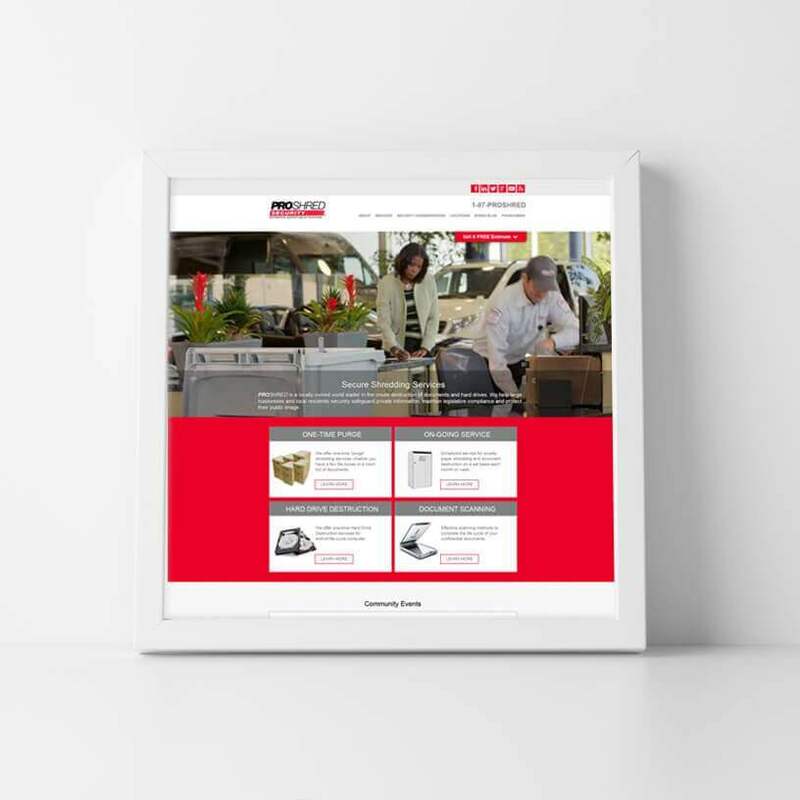 Mobile-Optimized for Any Device. 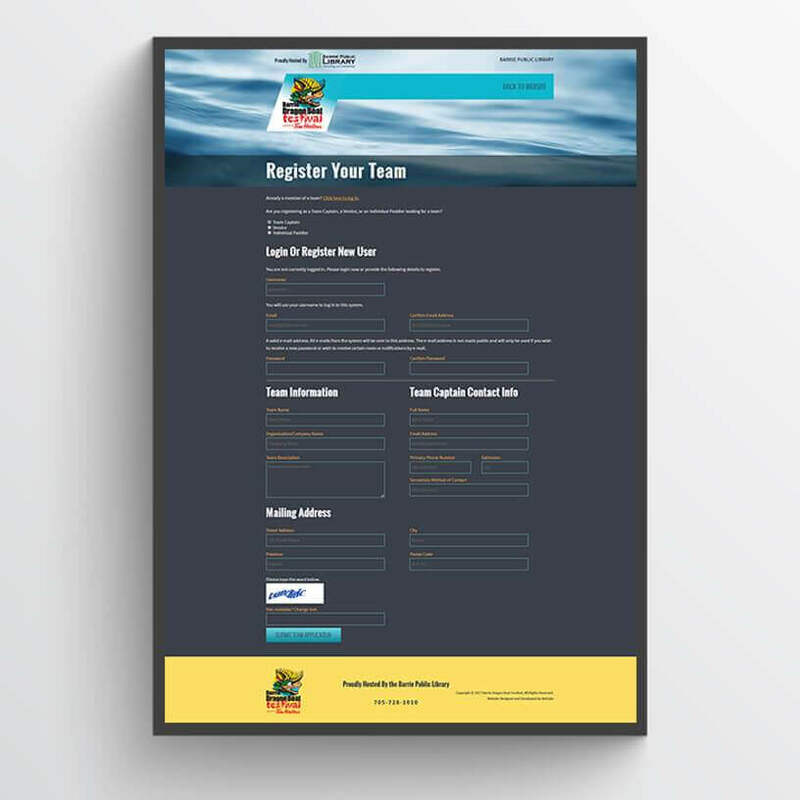 We integrated a password-protected user portal for team registration and management featuring multiple access levels for users, team captains, administrators. 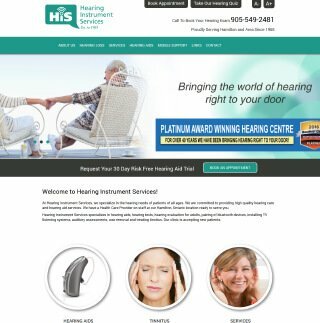 About Our Client: At Hearing Instrument Services specializes in the hearing needs of patients of all ages. 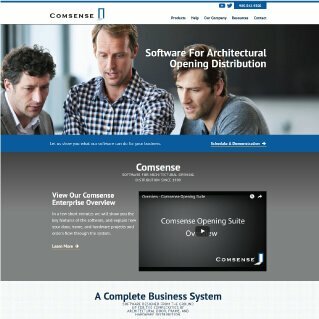 The Project: Website Design and Development. 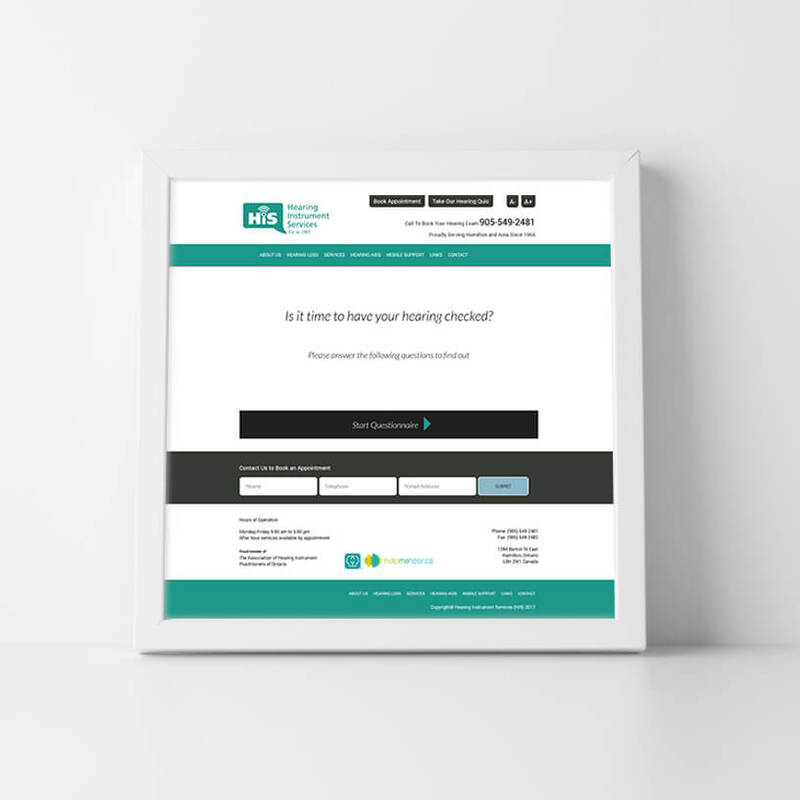 Special Features: This website was designed with a focus on appointment booking and information. 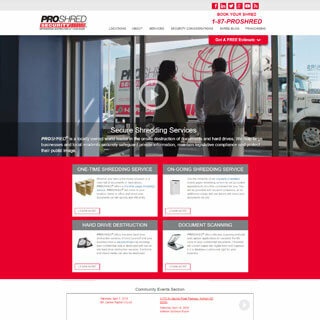 About Our Client: PROSHRED® is a locally owned world leader in the onsite destruction of documents and hard drives. 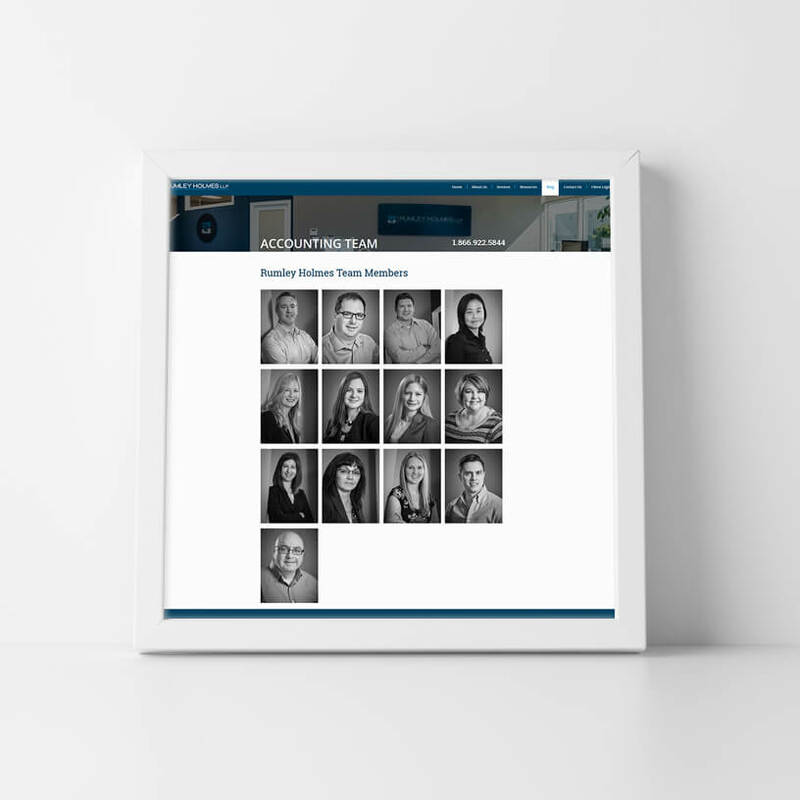 We help large businesses and local residents securely safeguard private information, maintain legislative compliance and protect their public image. 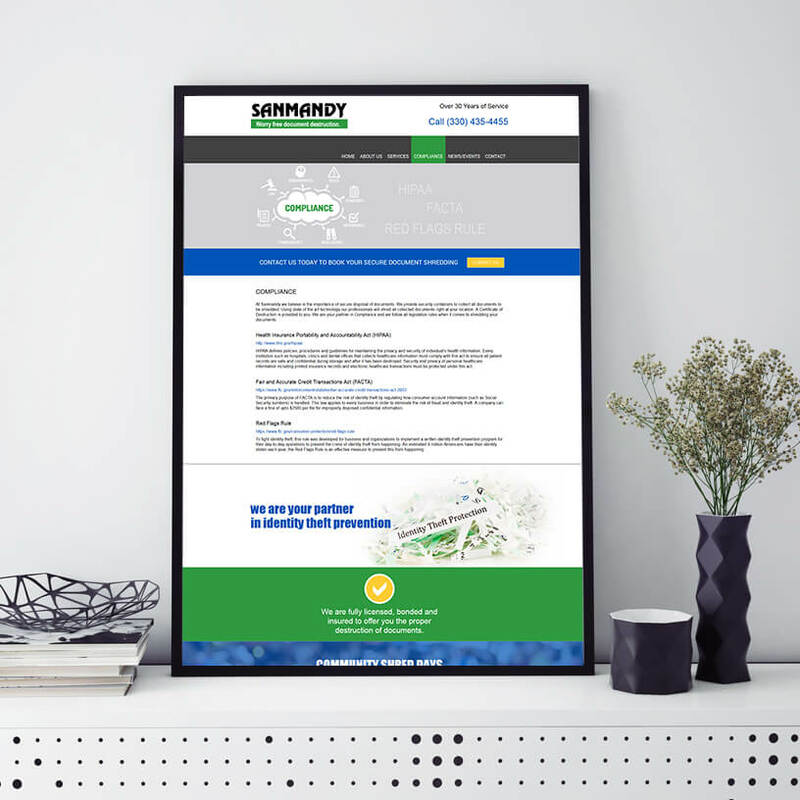 Web Design and Development. Mobile Optimized for Any Device. 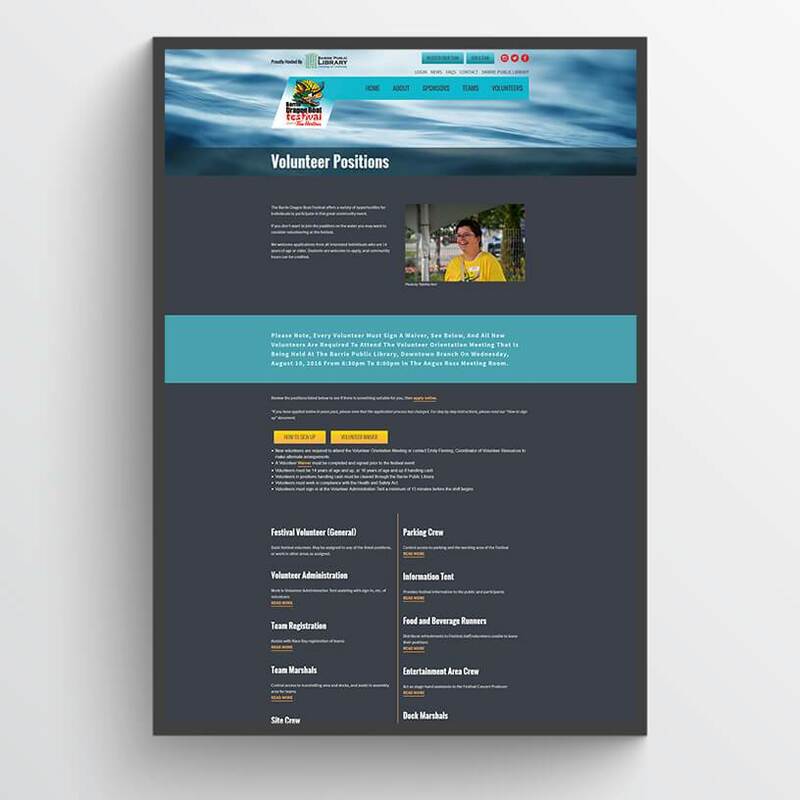 WordPress multi-site with multiple user roles for various access. Special Features: Web Design and Development. Mobile Optimized for Any Device. 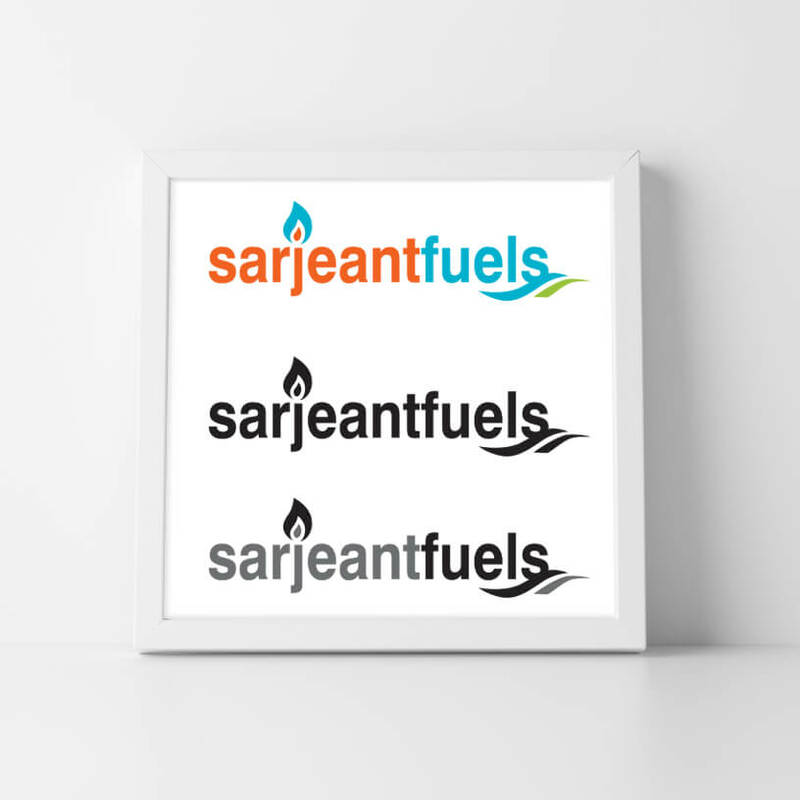 The Sarjeant Company provides ready mix concrete, aggregate, asphalt, petroleum fuel, redi-rock retaining wall systems, heating & cooling products, heating oil, propane, lubricants and has 4 cardlock locations throughout Ontario. 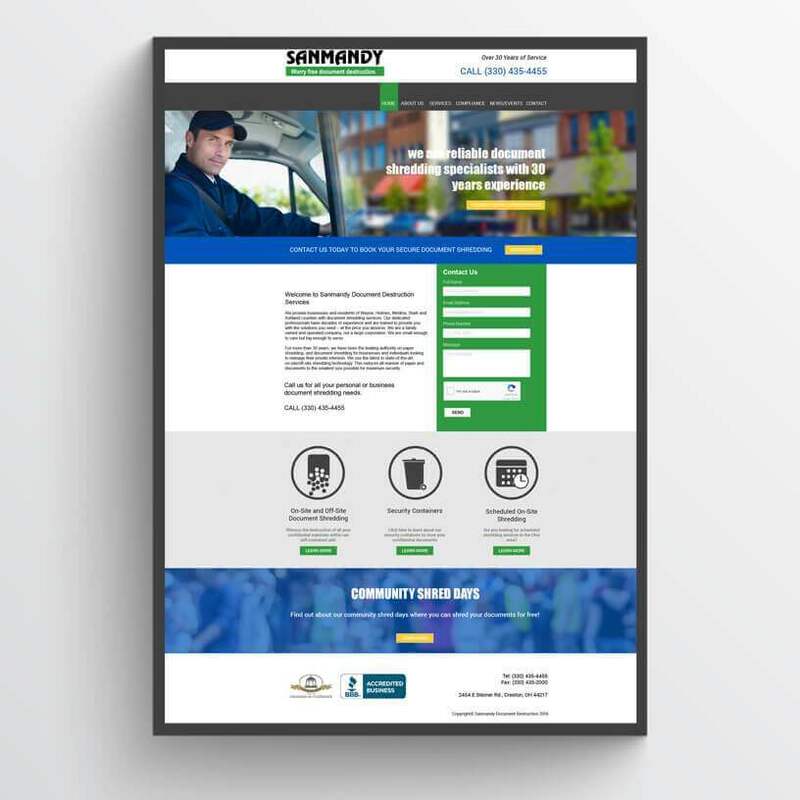 The Sarjeant Co. Ltd. needed a site that effectively split the company into independent sections for the different divisions of the primary business. 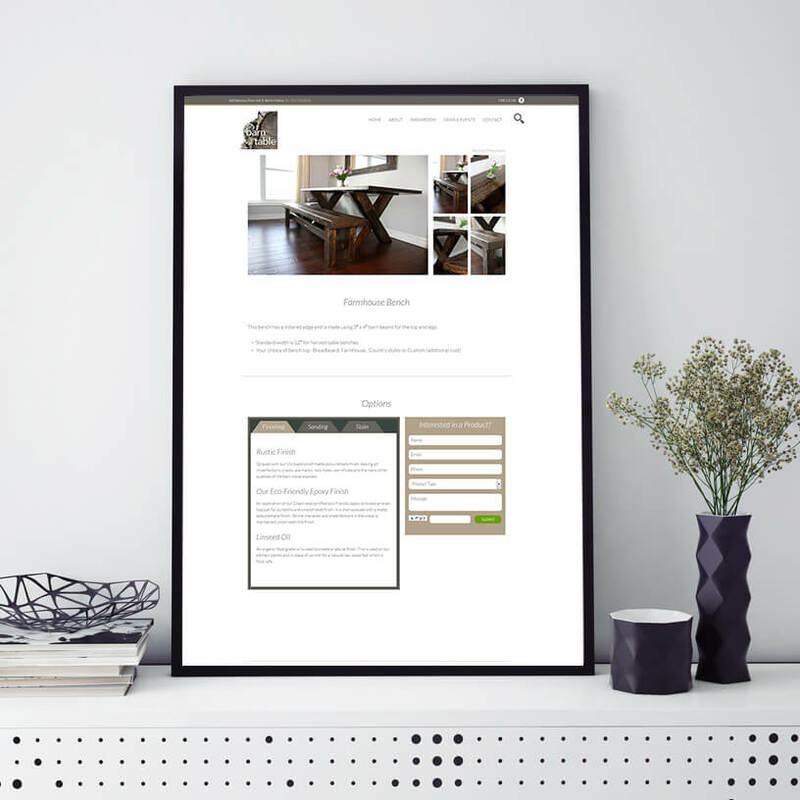 The development of the site required the creation of a main site design that could also be used as a basis for each of the sub-sites. 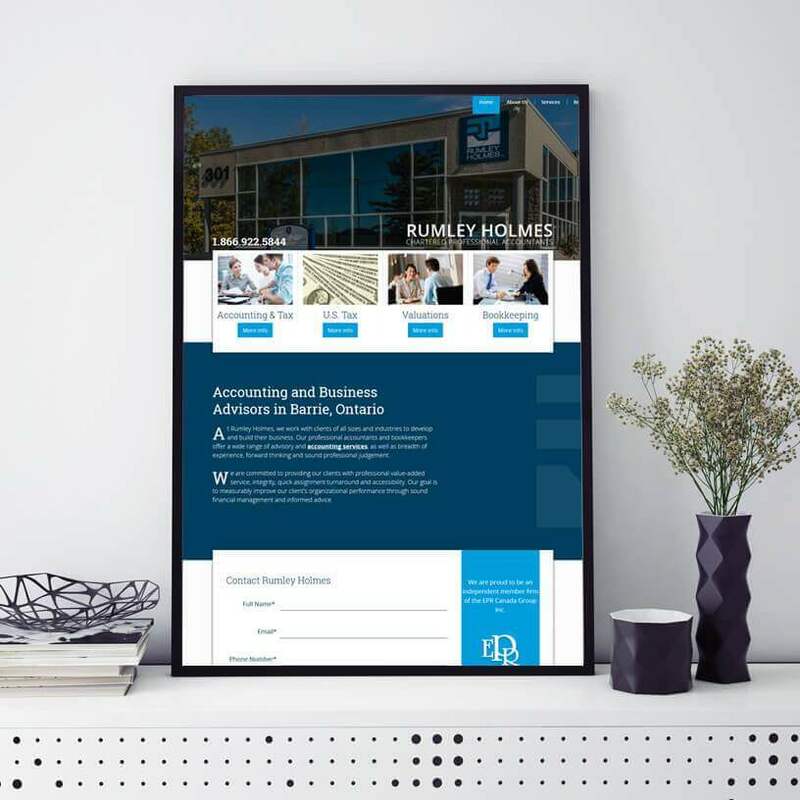 Accounting and Business Advisors in Barrie, Ontario. 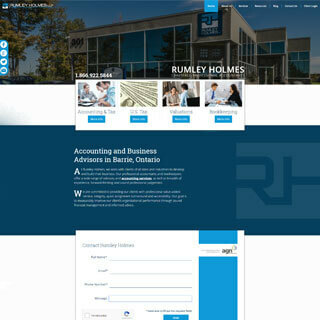 Rumley Holmes works with clients of all sizes and industries to develop and build their business. 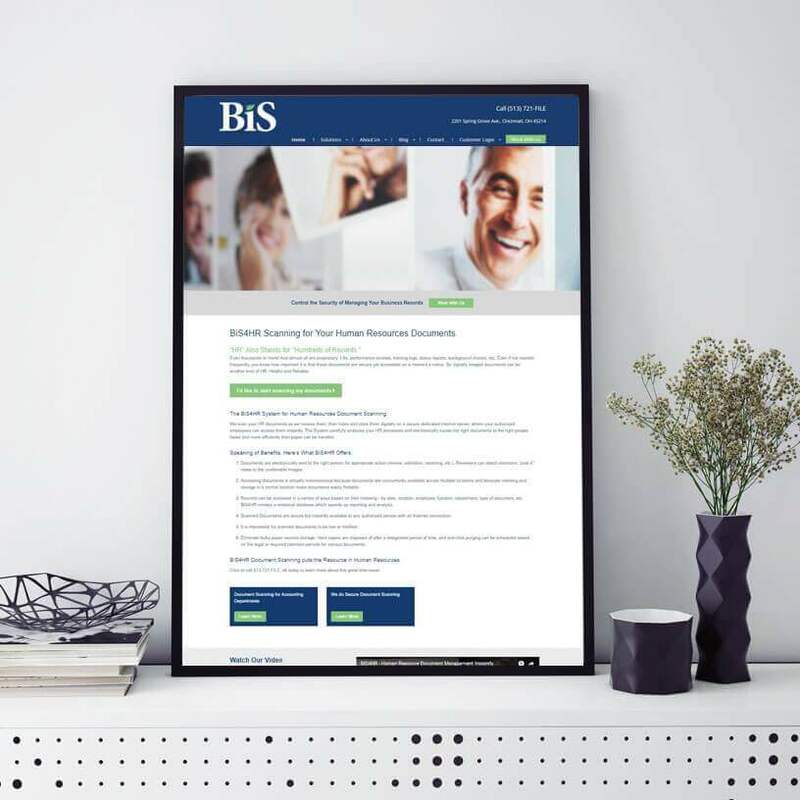 Our professional accountants and bookkeepers offer a wide range of advisory and accounting services, as well as breadth of experience, forward thinking and sound professional judgement. 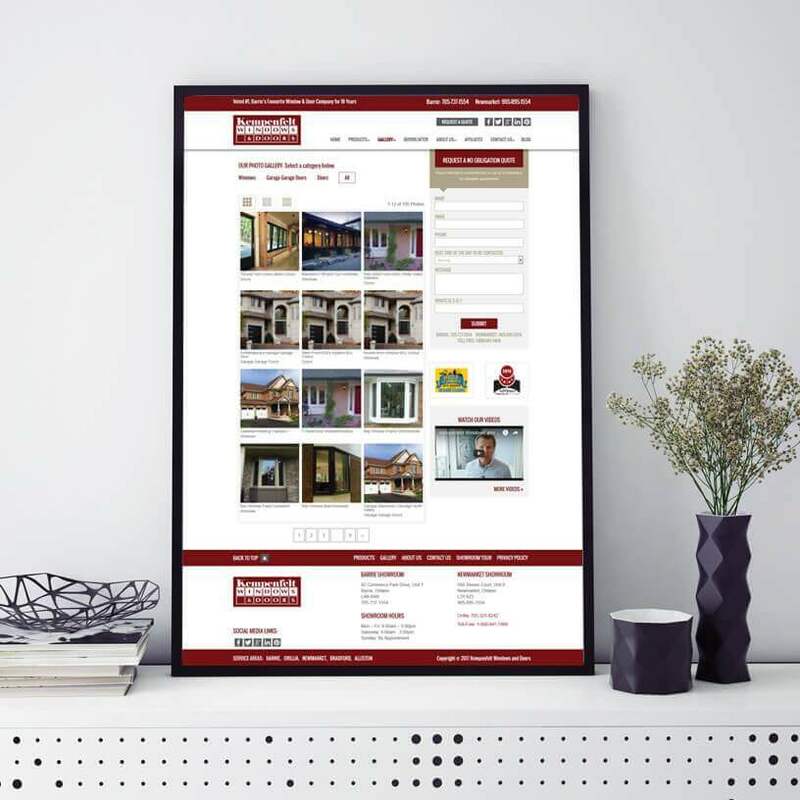 Web Design and Development. Mobile Optimized for Any Device. 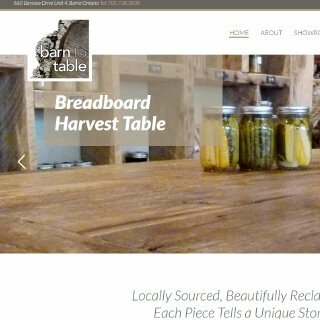 About Our Client: Barn to Table recycles old, locally sourced barn wood to create beautiful furniture and they consider it a major step forward in improving our world. 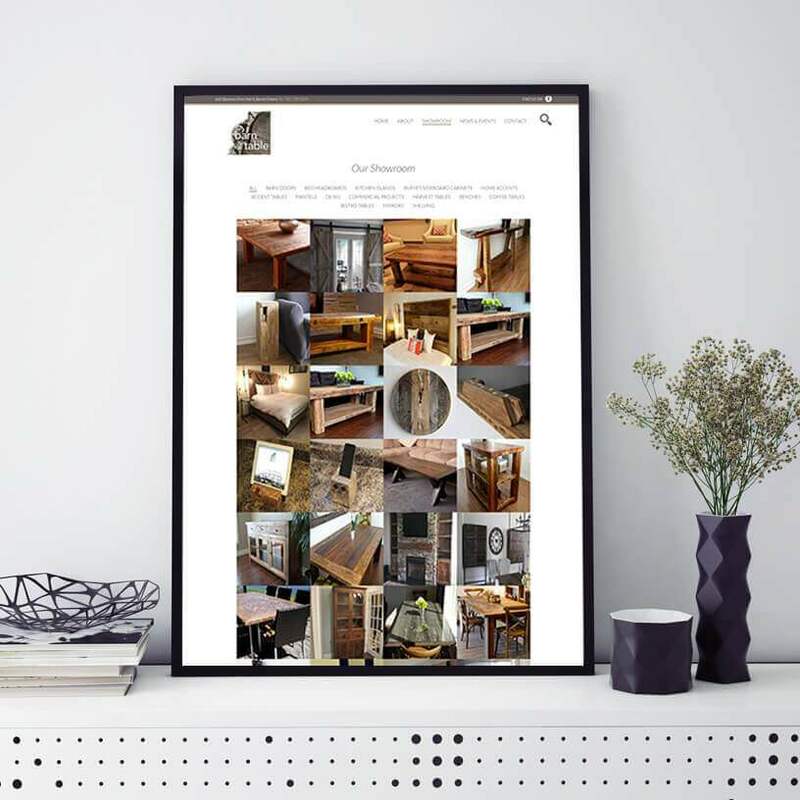 They share the process of building your furniture with photos along the way, from the barn to the boards, right down to the finished, distinctive product. The final piece is truly crafted for you. Worry-free, convenient cottage rentals for discerning Muskoka area cottage owners and renters. 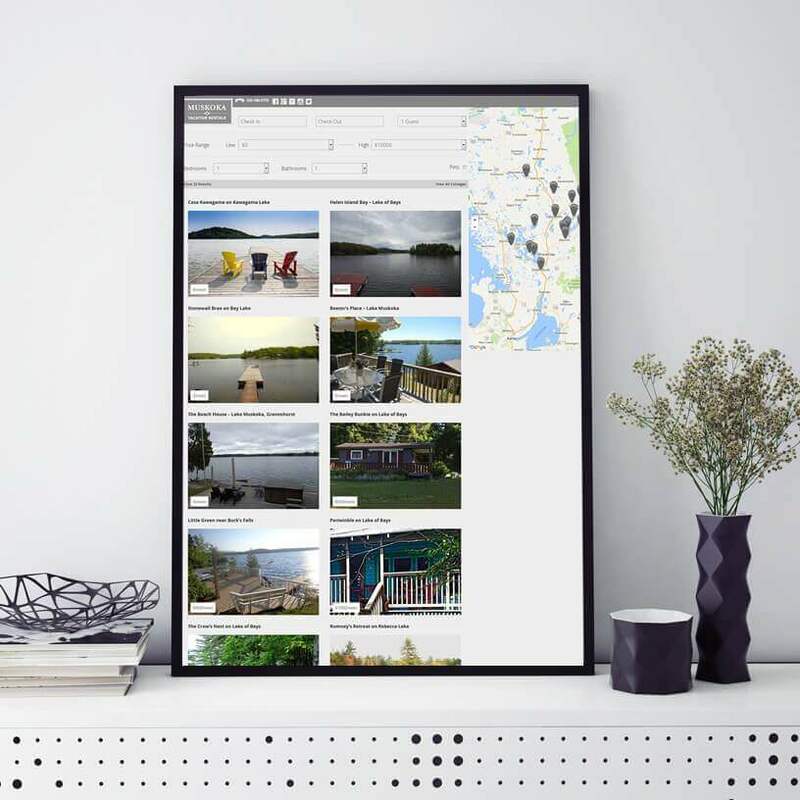 Muskoka Vacation Rentals is an online and in-person cottage rental service that connects Ontario cottage owners and renters. 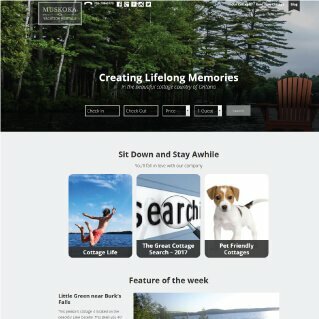 Come to Muskoka to enjoy its natural beauty and serenity and create life-long memories. Provide businesses and residents of Wayne, Holmes, Medina, Stark and Ashland counties with document shredding services. 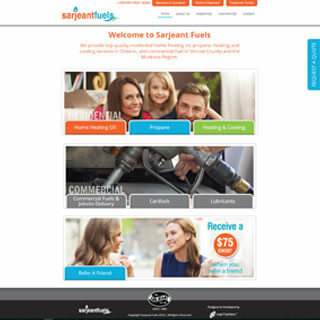 About Our Client: Sarjeant Fuels provides top quality residential home heating oil, propane, heating and cooling services in Ontario, and commercial fuel in Simcoe County and the Muskoka Region. 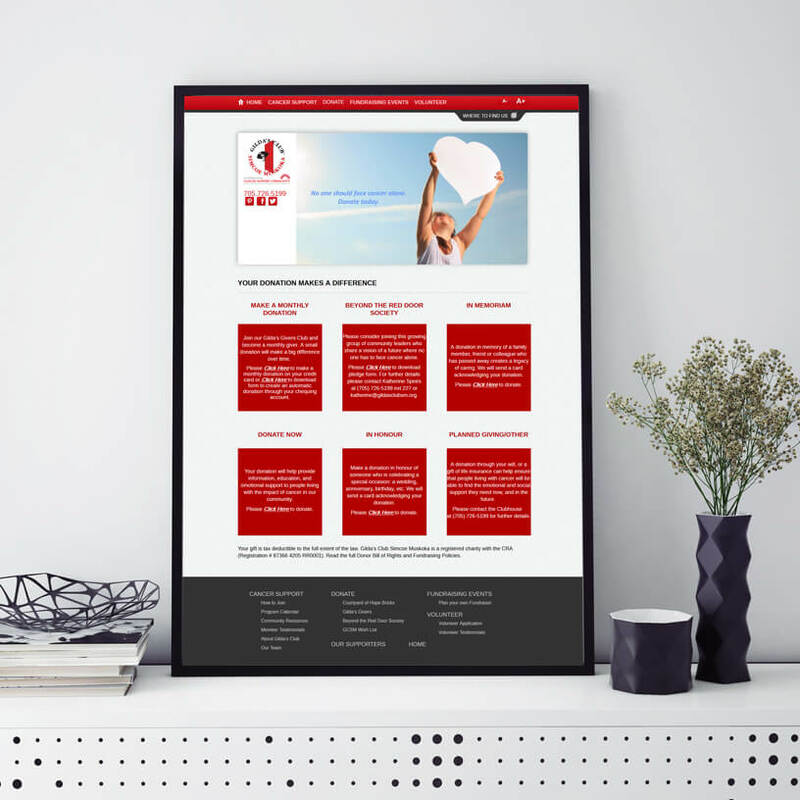 The Project: Brand Design, Printed Collateral – Service Brochures, Website Design, Brand Development and Guidelines. 04. QUESTIONS PROVIDE ANSWERS. ASK. 05. TO THE CLIENT, WE ARE THE SOLUTION. 08. BE PASSIONATE ABOUT YOUR WORK. 10. HAVE FUN WHATEVER YOU’RE DOING!